Beetroot Poori Recipe with step by step instructions.తెలుగు వెర్షన్. 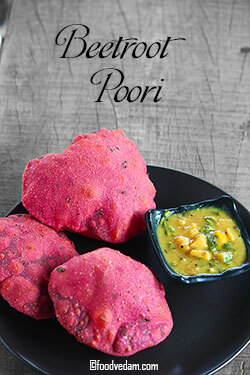 Beetroot poori is very tasty and tempting breakfast recipe.beetroot has many nutritional values.but few people don’t like to have it in their regular diet.they may not like taking it as a salad.this would be the best option for those people.not only this but beetroot chutney, fry, and pulao are also best options. 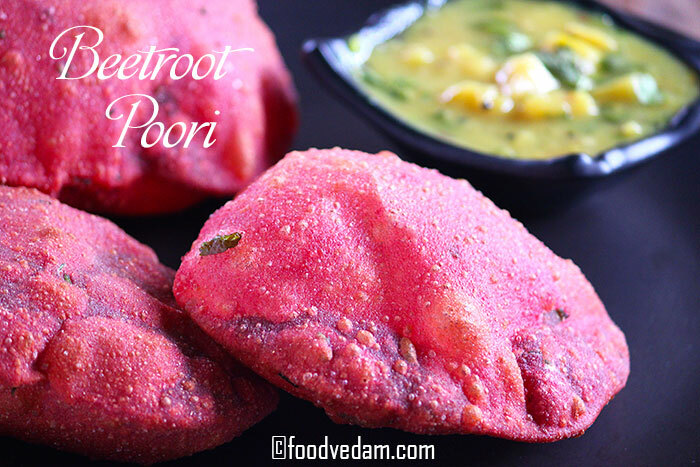 I prepare beetroot recipe at least twice in a week.Beetroot pulao and Beetroot fry are my regular recipes.both the recipes taste too good.I prepare beetroot pooris very occasionally as I don’t like deep-frying the beetroots in any way. coming to the recipe, we need to follow few instructions to get soft and puffy pooris.you need to mix the dough hard.otherwise, the pooris may absorb a lot of oil.the pooris should be pressed with 2 to 3 mm thickness at least.ohterwise, they won’t puff up and may come out like hard crispy biscuits.the pooris should be fried in hot oil.that means the Poori when dropped into the oil should immediately float to the top and puff up.It happens only when the oil is hot.These pooris taste good when served with Bombay Chutney or Green Peas Curry.I hope you try and enjoy the recipe. Click here to watch our Video Recipes on YOUTUBE. Put the beetroot pieces in a blender. Pour water and blend until the juice comes out. Strain out the juice and keep aside. Take the wheat flour into a mixing bowl. Add salt, oil, chopped coriander and mix well. Add beetroot juice little by little and mix well until the flour turns into a hard dough. Apply some oil, cover and leave for 30 minutes. Cut the dough into equal parts and make into round balls. Take each ball and press them flat. Spread them into flat round shape. But make sure that each poori should be of at least 2-3 mm thickness. When the oil is hot, leave the poori carefully. Wait until it floats to the top. Start pressing the poori gently with a turner until it puffs up completely. Repeat the process until all the Pooris are done and serve hot with poori curry.